If you don’t have tomatoes, try adding 3/4 cup cooked, sliced carrots instead. Heat oil in a large skillet over medium-high heat (350 degrees in an electric skillet). Add celery and onion. Cook 4-7 minutes until soft. Add cabbage, green pepper, salt and pepper. Cook for 5-10 minutes, stirring often so the cabbage sweats. Add tomato and serve immediately. 1 Comments for "Cabbage Stir-Fry"
The flavors blended very well. Tasted simple and fresh. 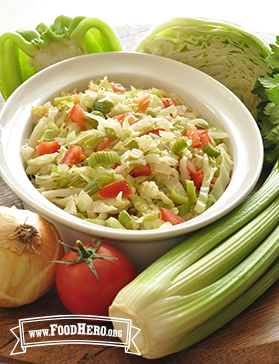 This recipe was a great way to use the leftover cabbage in my refridgerator!